Since our trip to Hong Kong, rif and I have grown quite particular about the Chinese food we eat in KL. 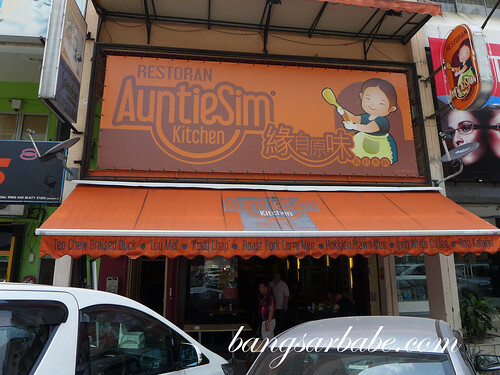 That said, I recently enjoyed a good lunch at Aunty Sim in Damansara Uptown over the weekend. 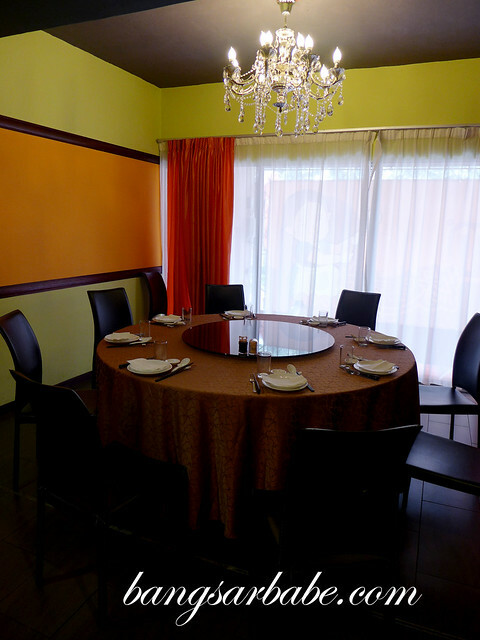 The restaurant is divided into two floors – ground floor for quick meals and the upstairs serves as a venue for private dining. I sampled a range of specialty dishes and double boiled soups from the private dining section, prepared by Chef William Kwok. William comes from Hong Kong so most of the dishes I tucked into that afternoon reminded me of the food I tried in Hong Kong. 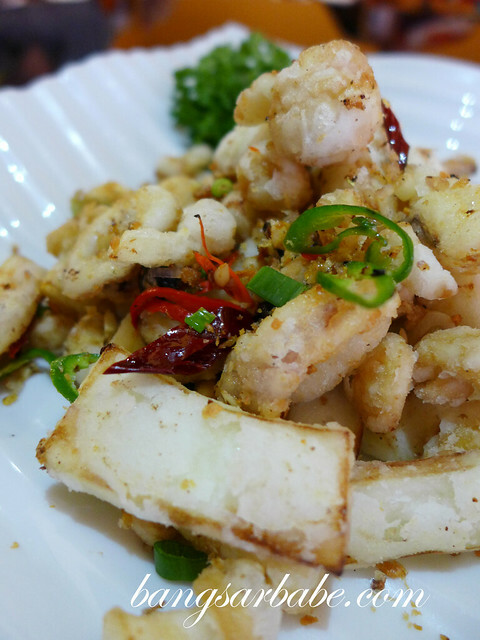 To start, we had the salt and pepper combo – a light appetizer of squid, mushrooms and brinjal, battered and fried till crispy perfection. I liked how this wasn’t oily despite being deep fried; it takes skills to achieve such result. 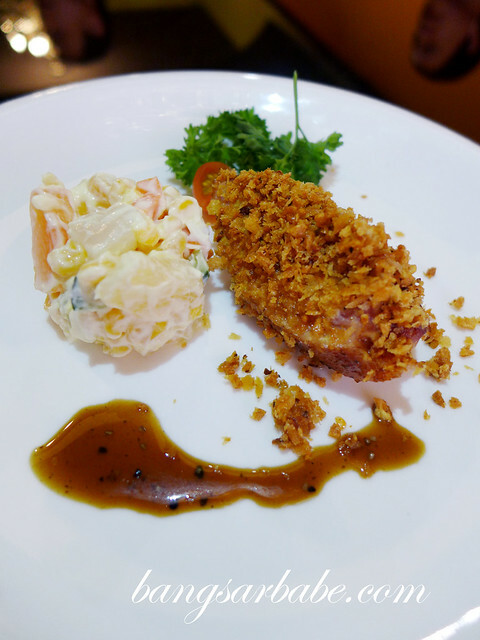 The French-style smoked duck was coated with garlic bits, chilli flakes and breadcrumbs, served alongside Aunty Sim’s house salad. I was told the salad takes three days to prepare and doesn’t get soggy even when it’s left out for long. The duck was delicious. Moist and flavourful within, English mustard was used to kick the oomph up a notch. 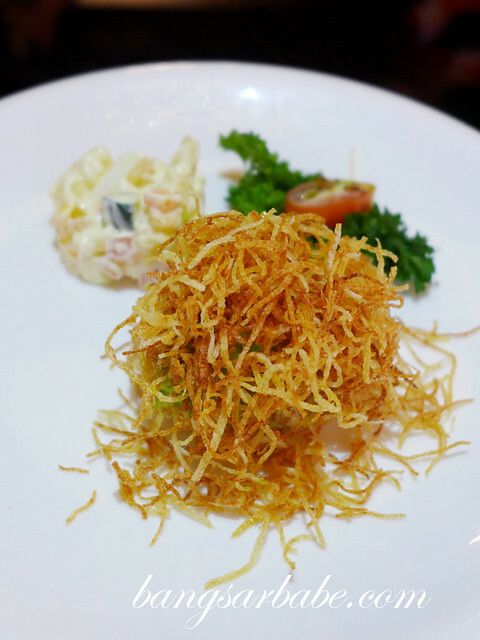 Another starter I enjoyed was the scallop, cooked just right and topped with crispy potato. The latter was very addictive, but the scallop remained the highlight. 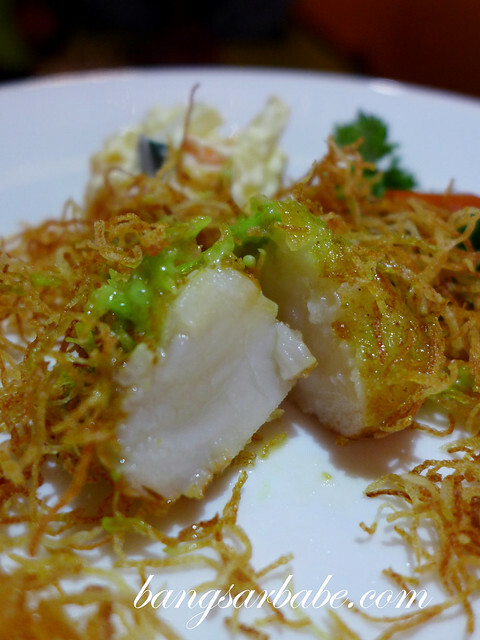 A bit of wasabi was used to complement the sweetness of the scallop. 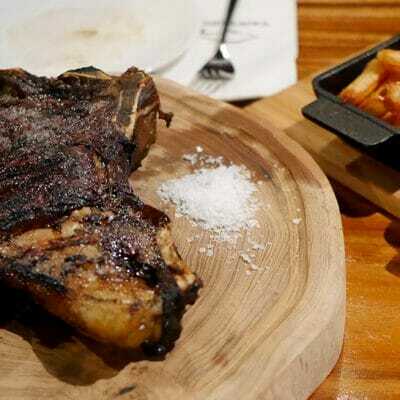 William also dished out a plate of black pepper US Angus beef – medium rare and beautifully tender. 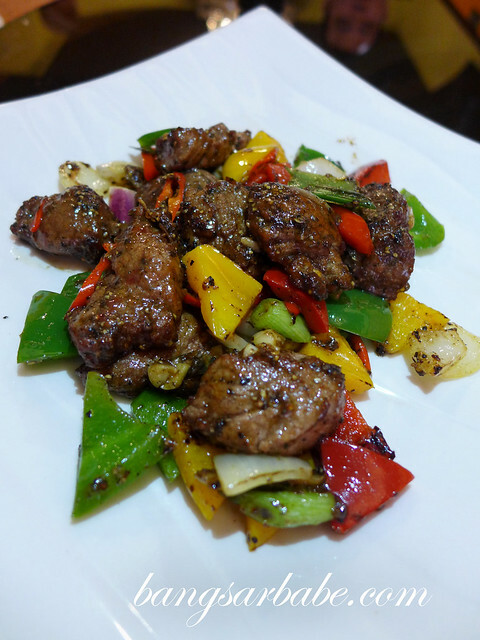 This was a good example of Oriental cooking using Western ingredients and no tenderizer was used to prep the beef tenderloin. rif too, enjoyed this dish very much. Double boiled soups are Aunty Sim’s forte and rightly so. 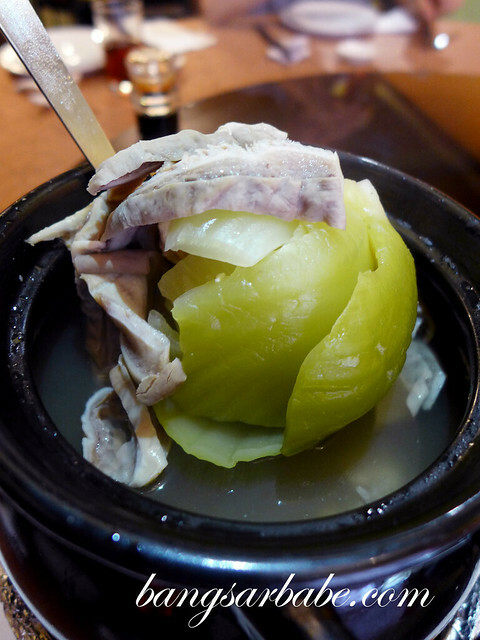 When they brought out a pot of papaya, apple and pear soup, I got very excited. Papaya soup happens to be a childhood favourite of mine, and this was good stuff. The soup was double boiled for two hours to get all the goodness from the dates, apples, papaya, fig and meat — it was sweet and packed with flavour. By the way, only mineral water is used when preparing the soups here. I was less excited about the pig stomach soup because I’m not a fan of offal. But one bite into the pig stomach changed my mind. There was no (offensive) smell as they use Coke to clean the intestines. The soup was peppery and flavourful from the pork shoulder, preserved vegetables and chicken. Tilapia with braised bittergourd was a simple dish done well. 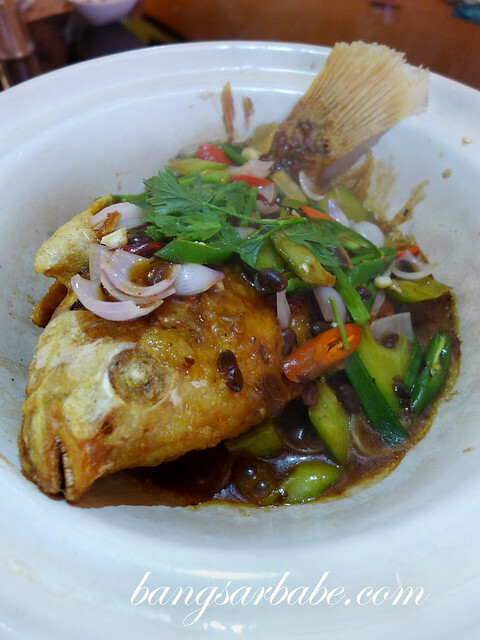 The fish was deep fried till crispy on the outside, and further flavoured with fermented black beans and bittergourd slices. White rice would go very well with this, but I didn’t have the luxury of stomach space that afternoon. Sang Har noodles is said to be a must-order at Aunty Sim and rightly so. 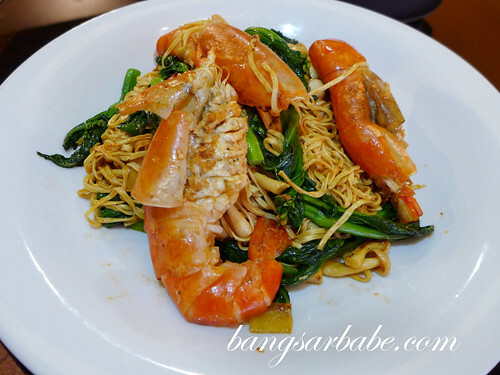 The yee mee (imported from Hong Kong) was cooked al dente and tasty from the prawn roe and stock. I also liked the addition of mushrooms for an extra bite. 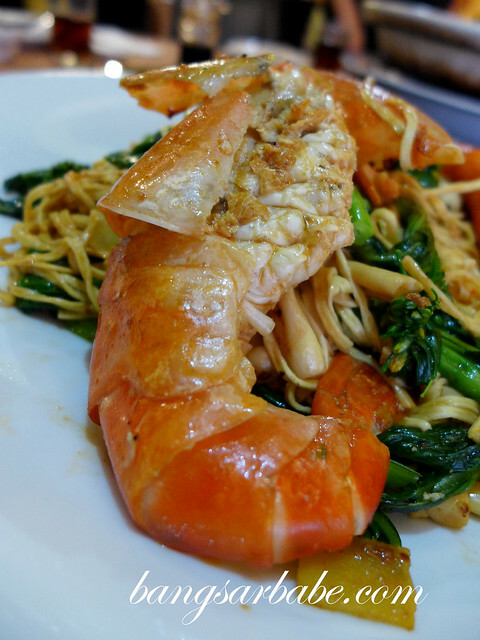 While the prawns were fairly large and tasty, it was the noodles that rocked my boat. 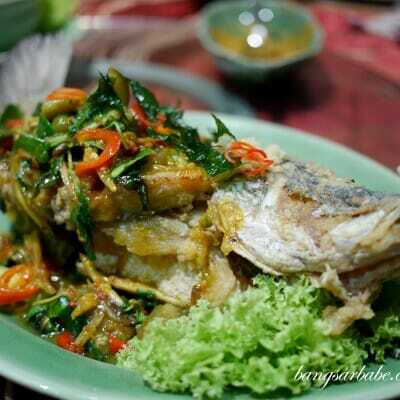 A portion like the above cost RM100, and easily feeds four adults. 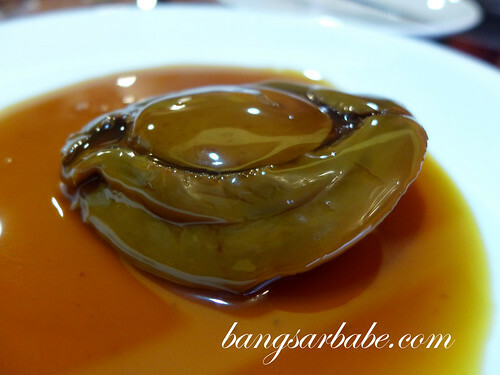 I also tried some Xurong dried abalone and found it to be one of the best I’ve tasted. 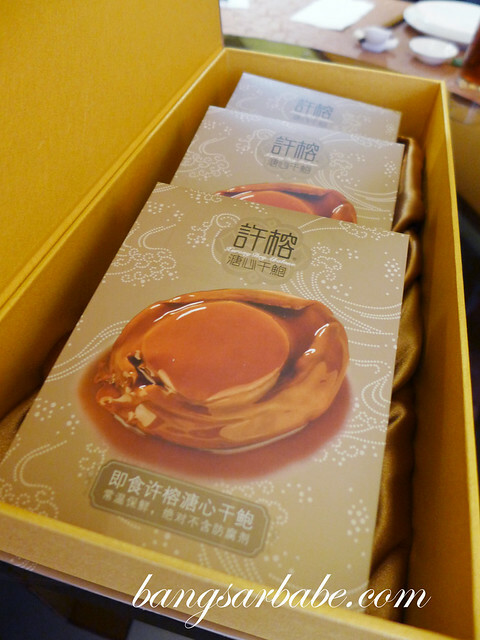 The abalone (12 head) tasted as luxurious as it looked. 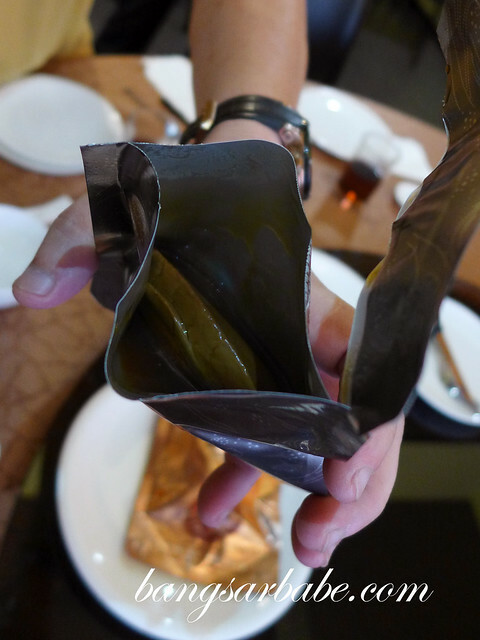 The gravy which came with the Australian abalone was delicious and aromatic from the essence of the abalone. You can purchase this at Aunty Sim for a very reasonable price if you’re interested. 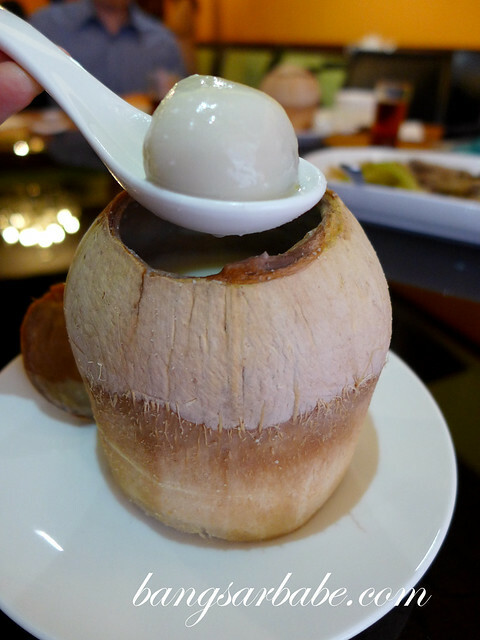 To cap off my lunch, I had the almond milk with black sesame tong yuen in Thai coconut. 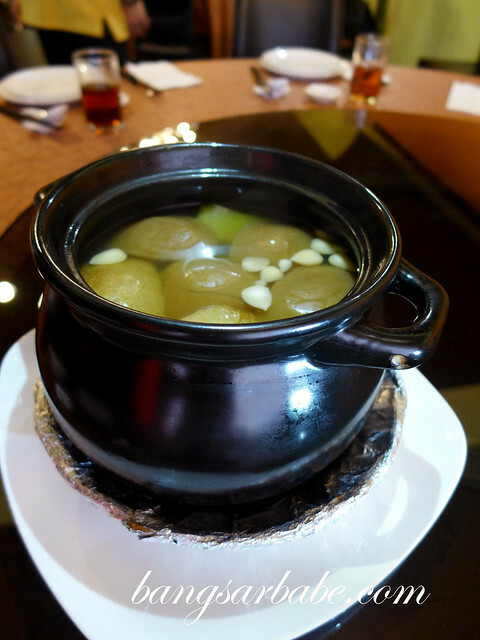 It was very similar to the tong sui I had in Hong Kong. Now I know where to go to if I’m ever craving good Hong Kong dessert. This needs to be pre-ordered (at least 2 hours before) as it is made fresh. There is no menu available at private dining side. All you need to do is give the restaurant a budget and they will prepare the menu accordingly. From what I was told, it’s pretty reasonable. Thank you Aunty Sim, for hosting lunch! Verdict: Quality ingredients and good food. I’m already planning my next visit with dad so he can try the sang har noodles. Btw, how’s the pricing here, seem like not cheap huh..? How many person can fit in the private dining area? They can fit about 30-40 pax comfortably.